A surviving female student from the Red Mosque is wanting to open jihad schools throughout Pakistan. 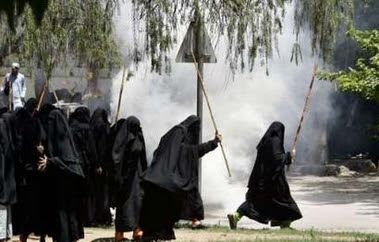 The “Chicks with Sticks” eventually gave up to authorities during clashes in Islamabad. A young female student who survived the siege on Islamabad’s Red Mosque spoke out today on her plans to work for jihad. 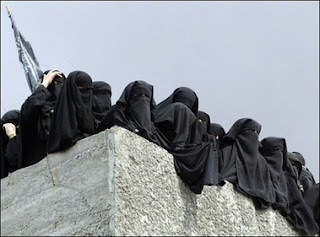 She also said that the students were told that the Prime Minister told their imam to come out in a burka. We wanted to carry out suicide attacks. We didn’t have enough ammunition to fight face to face. We had a small number of arms with which our mujahideen brothers were fighting. After the evening prayer we found out that Maulana Aziz – the chief cleric – had been arrested while he was trying to flee wearing a burka. We were told that he’d been called to speak to the prime minister. They took us to another room and gave us food. We were crying a lot because Korans were burning inside the Red Mosque which was on fire. After meeting my father, I was overcome by grief as I had hoped to be a martyr and come back alive. Now they’ve attacked the Red Mosque and Jamia Hafsa [the seminary attached to it], I hope the whole country will have Red Mosques. I will work for jihad, and open a madrassa and train people for jihad. 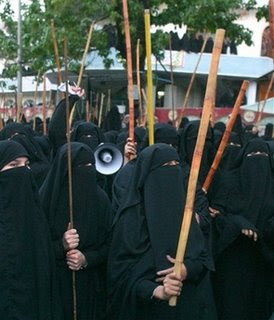 MASSIVE Rally in Pakistan Against Radical Islamists!